In Dolly Bureau (vol 3), I made a few patterns for tiny dolls, one of which is a design for PukiPuki. Pictured below is the final result of the pattern, which has easy-to-follow written and illustrated instructions in the book. Best of all, the clothing should fit other dolls like Mattel Kelly and Ruby Red Galleria's Honee-B. The most recent installment of Dolly Bureau volume 3 focuses on tiny dolls, but some of the crafts and sewing patterns can be used for dolls of multiple sizes. The picture below is a drafting dress pattern that would use a combination of knitted and tulle/lace fabrics. Dream High Studio's Lulu is pictured. She's so tiny! 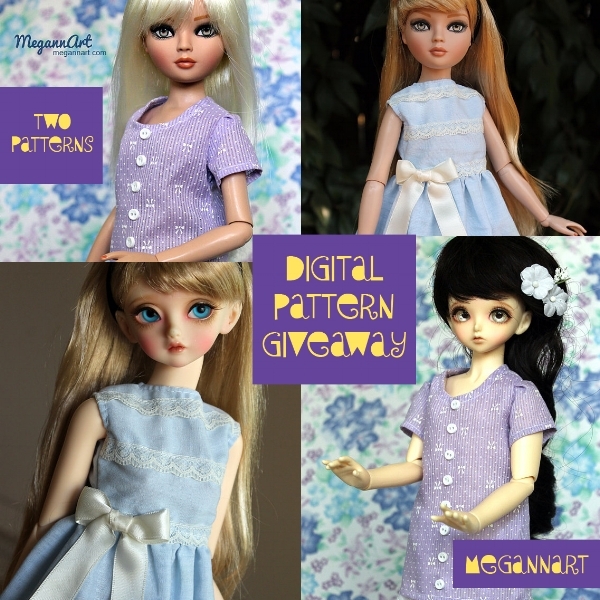 In the recent months, I was focusing on digital PDF patterns for ball-jointed dolls. Not too long ago, I finally finished a pattern for Momoko dolls. It's a simple set, but I think using striped fabric looks great for the blouse. I tried the outfit on a variety of other dolls and it is confirmed to adequately fit Pullip, J-doll, Tiny Kitty (very snug), Petite Barbie, Pure Neemo (all bust sizes), and Jenny. Support an artist! Visit my Etsy shop. You can also follow my Twitter, Facebook, and Pinterest pages. This new pattern combines a whole lot of things I love -- white eyelet fabric, lace, long dresses, ribbon, and my new KoonieS. As some of you may know, I have a few Peak's Woods dolls, but I was glad to add KoonieS to the family. The dress pictured is a pattern available in my Etsy shop. I am trying to put out quite a few more digital patterns in the near future, so stay tuned for plenty more dolly sewing options in the weeks to come.